Call it camping. Call it Glamping. Whatever you call it, within minutes of arriving you will probably be calling Harvest Moon Holidays paradise. This seriously cool site reclines in the sleepy region of East Lothian, a wonderland of epic sandy beaches, golf courses and cute wee farm shops and cafes. It may be less than an hour from Edinburgh, but it feels more remote, a feeling accentuated by the final bumpy drive down through the fields. Park up and grab a wheelbarrow, then say goodbye to your car and the rest of the modern world. Slip past the towering pines towards the child-gasp-inducing treehouse, the bountiful play store and the characterful old boat that houses the site shop. Once you’ve settled in and fed the hens, go for a clamber up the dune to take in the views of the coast, from Bass Rock in the north down to the ruined castle of Dunbar on the promontory to the south. Dead ahead is an expanse of the North Sea with just the occasional passing cruise ship out on the horizon. The south-east coast of Scotland must be the least visited part of a country that’s always crawling with tourists. With the great aortic artery of the A1 slicing through the land perhaps it’s no surprise that most folk coming from the south, from the Romans to the English armies, have made a beeline for Edinburgh without bothering to stop – unless, of course, there was a Scottish army standing in their way. But there’s a host of reasons to explore the stretch of coast from the border at Berwick, past St Abbs and Dunbar. There are cliffs, castles, sandy bays and battlefields and a Domesday directory of ancient villages. Back on site, in a wide grassy field sheltered behind the sand dunes are the 14 encampments comprising seven luxury treehouses and safari tents. The tents and treehouses sit about half a mile from each other, so everyone has acres of space. They do have a bit of ‘Out of Africa’ romance about them. With sweeping vistas over the farmlands and epic sand dunes, these treehouses and tents boast at least 2 proper double beds, bunk bed, double sofa bed and the impossibly cute cupboard bed, ideal for little princesses or princes on a slumber party. You'll also find a woodburning stove, proper toilet and a shower better than most guests have at home. Parents can sit on their decks and watch their children forget all about TVs and electronic gadgets. Soon they are lost in a world awash with chickens, rabbits and geese, with horses and ponies to pet in the nearby fields. You can even ‘hire’ your own hen for the weekend, which delights wee ones as they race to check every morning whether their own breakfast has been laid. 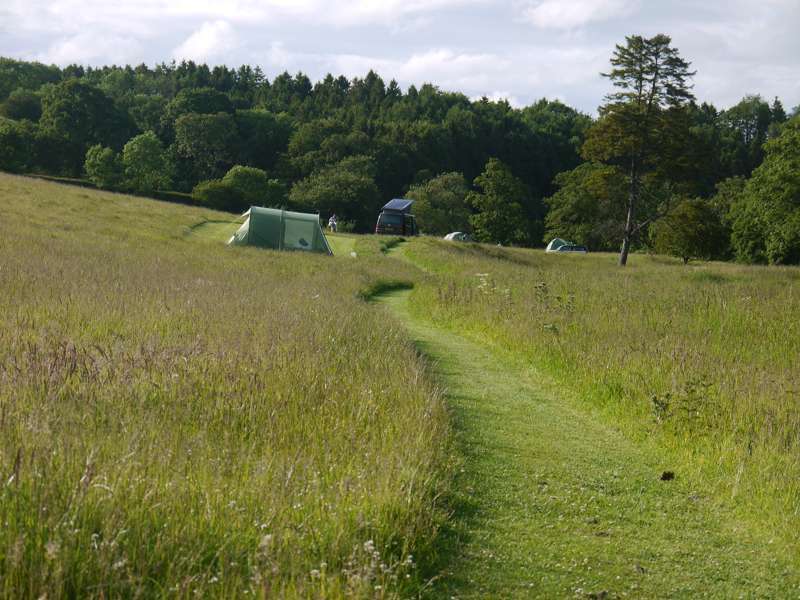 Then there is the site’s woodland to explore and, of course, the beach, and what an epic miles long beach it is in camping, glamping paradise. 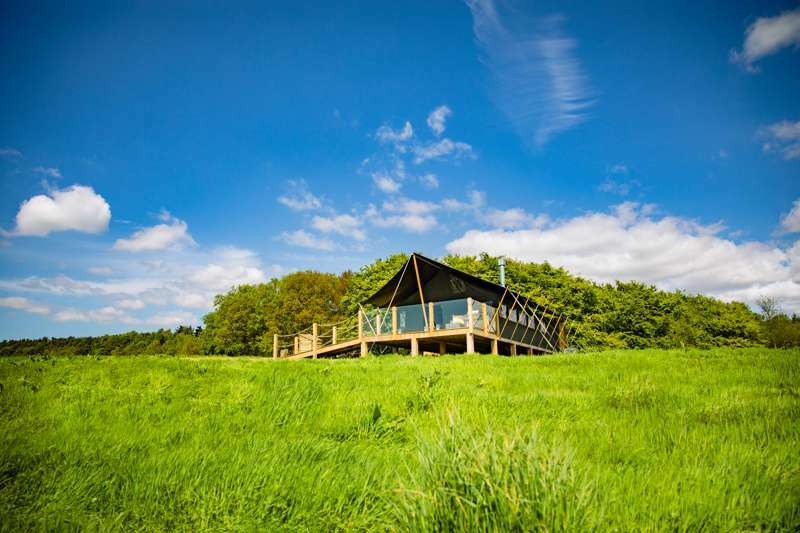 On one of the most beautifully situated farms in East Lothian we offer you a unique ‘glamping’ experience in fabulous safari-style tents and new Luxury Treehouses. Our 7 luxury safari tents and 7 Treehouses are set under the trees on the soft sandy dunes by the beach. Both the Safari Tents and Treehouses are fully furnished with en-suite hot showers and WC ,wood burning stove and Kitchen. 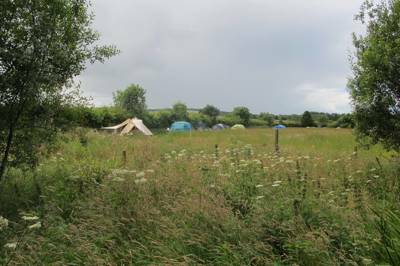 Both sites are set within acres of space near our fabulous beach, with BBQ and campsite facilities on site. Our newly created kids corner is filled with chickens, ducks, bunnies, lambs, ponies will provide plenty of fun for kids and grown ups alike! We look forward to welcoming you soon! Campfires allowed. 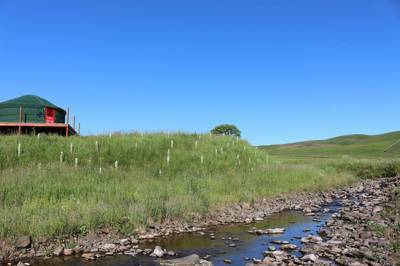 Seven pre-erected tent encampments & seven wooden treehouses (the two camps are situated half a mile from each other). No electricity. 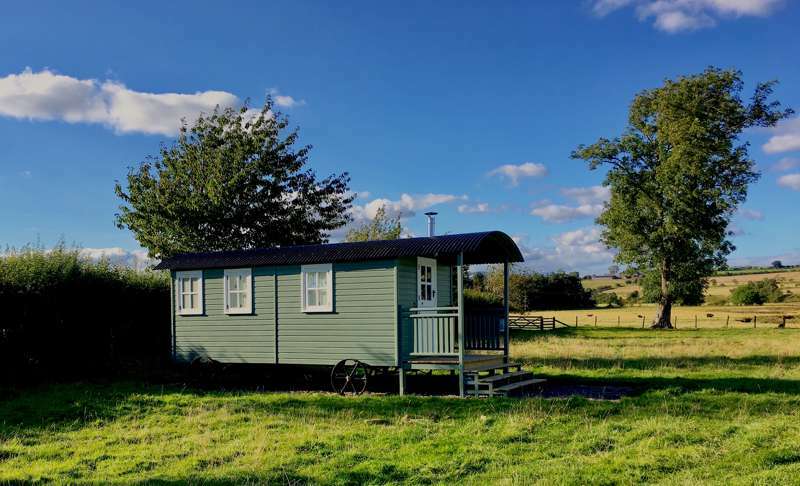 Each unit has its own wood-burning stove, modern (candlelit) en suite toilet and superb hot shower. Chicken and ducks roam around (private chicken runs can be rented), whilst horses and ponies await petting. Free play store laden with toys and treehouse for young ones. Honesty shop stocks essentials and local produce. BBQ and campfire facilities. Daily ice packs free for use in non-electric cool boxes. Vast beach just beyond dunes. Take a trip to see Concorde at the National Museum of Flight (01312 474238). The site has a number of locals who can source fresh lobster and other seafood. The welcome pack also has details of local food suppliers. North Berwick is famous for its lobster with the Lobster Shack (07910 620 480) the freshest, best venue for lobster and chips down on the harbour, which goes down very well with the local cider, Thistly Cross. The Crown Hotel (01620 860 335) in the cute wee village of East Linton has a great bar stocked with Scottish ales, whiskies and an open fire, with a bistro on hand too. The Linton Hotel (01620 860202) has a good range of ales and whiskies and is a little ‘Laura Ashley’ and serves cracking meals. 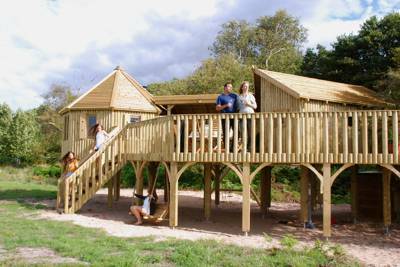 Treehouses: April – mid December plus New Year. Safari Tents: April - beginning Nov, plus New Year. Come off the A1 by Haddington or Dunbar and take the A199 (it’s the old A1 and runs parallel to the new road). Turn off on to the A198 at the signpost for Tyninghame and follow the straight road until you see the small sign for Lochhouses pointing up a track to the right (it’s just before the road bends left). Follow the track all the way past some cottages and through the farmyard to the farmouse. There are regular trains on the main east-coast line stopping at Dunbar, from which there’s a no. 120B bus service run by Eve Coaches (01368 865500) that passes by Tyninghame and Whitekirk, but it’s a long walk from the road to the farm.